Cosco Scenera NEXT Launch Party! 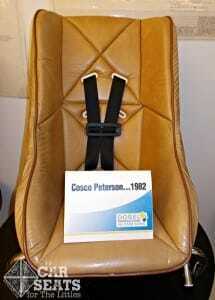 When Cosco invited Car Seats for the Littles to their Scenera NEXT launch party, I was ecstatic! When I was chosen to go, I screamed. Literally. I called my husband and screeched, CRASH TESTS! I couldn’t imagine a better way to spend a Saturday afternoon than in a car seat plant that produces close to one million car seats a year. The Cosco plant boasts 700 employees and I was going to help them celebrate the achievement that is the Cosco Scenera NEXT. I toured the Cosco facility with Ryan Hawker (Senior Product Marketing Manager ) and two other guests of the party. We started in a room featuring all thirteen fashions available for the Cosco Scenera NEXT. On the wall, a movie was playing introducing the features of the car seat and where it was made. Some might be surprised to learn the NEXT is made right here in the USA, Columbus, Indiana to be exact. Many of the employees I had the chance to meet there had worked for Cosco for over 25 years, some over 30! That’s quite an accomplishment. How exciting to be able to see all the changes in technology over the years, not only to the car seats themselves, but the manufacturing process as well. to this seat now in 2014. The difference is amazing! Letter writing station at the Cosco Scenera NEXT launch party. These letters were included in the first run of seats sent from the plant! One exciting thing Cosco was doing today at the party was having the children of the families who work for Cosco to write personal letters to the consumers who will be purchasing the NEXT. The children were encouraged to say how old they were and who in their family helped make that car seat, as well letting the family know their new seat was made here in USA. Encouraging the parents to use their seat properly was probably the best part. These personal notes will be included in the first batch of NEXTs that are shipped from the plant. How awesome is that! Our next stop was the crash test lab where we got to witness a frontal 30 mph crash test using the 3-year-old dummy in a forward facing harnessed seat. It was terrifying to watch. You don’t even realize what really happens in that split second until you see the slow motion video. The dummies were fascinating though and the test sled was probably the portion of the tour I had looked forward to the most. It did not disappoint. Here I am with Ryan hanging out with the a 6-year-old crash test dummy. We briefly passed the static testing room where they do things like make sure your buckles are going to keep buckling (and unbuckling) and the handles on your rear facing only seats aren’t going to fall off. Important things! On to the 1.1 million square foot manufacturing plant where all the magic happens! In production today was of course the NEXT but also the Cosco Highback Booster. The average cycle time it takes to create a NEXT in the mold machine is roughly 58 seconds. In that time, the hot plastic in pumped into the mold, the seat is formed, cooled, and removed from the machine. The seat has to pass electronic quality checks before it is sent down the line. This ensures that a seat that is not safe for shipment doesn’t ever end up in human hands. It is all handled electronically as an extra safety measure. I have removed many a cover and a harness in my time, but I would never want to go against any of the employees I saw today in a speed race! Once the seat comes off the belt, the first stop is to have the rubber grips added to the bottom of the seat (great feature that will help add some stability to the installation). From there the harness adjuster is added, cover, harness, more stickers, a final electronic quality check is done, then manual and cup holder are added and into its storage bag it goes. Here’s one I watched being made from start to finish! The last quality check is done with cameras and lasers, very high-tech to help ensure Cosco seats all meet their high standards of quality. Cameras verify that the rubber stoppers are in, screws are all in the harness adjuster, and the harness is firmly on the splitter plate. If the censors spot an error, the seat then locks into the machine used and cannot be removed without a supervisor’s override. This again, helps ensure that no faulty seats make it into the consumer’s hands. From there we go see the Shining Star wall where families share their crash stories. Crashes are the number one killer of children ages 3-12 (it used to be 1 but thanks to more children remaining rear facing longer, the age has increased). Many families have taken the time to write to Cosco and let them know that their kids are safe because of their hard work making child restraints. Every Cosco employee passes this wall as they come to work everyday. What an awesome feeling to know that you helped save a child’s life! It’s why Cosco does what they do and why we as CPSTs do what we do. My time at the Cosco plant was amazing! It was definitely an experience I never would’ve imagined I’d get to have. I met so many people who were dedicated to the safety of child passengers, some even brought to tears over the release of this seat. To have an idea like this and watch it come to fruition, must give the greatest sense of accomplishment. We here at Car Seats for the Little are excited about our continuing relationship with Ryan and the rest of the Cosco team! Congratulations guys on all you’ve done this year for child passenger safety!